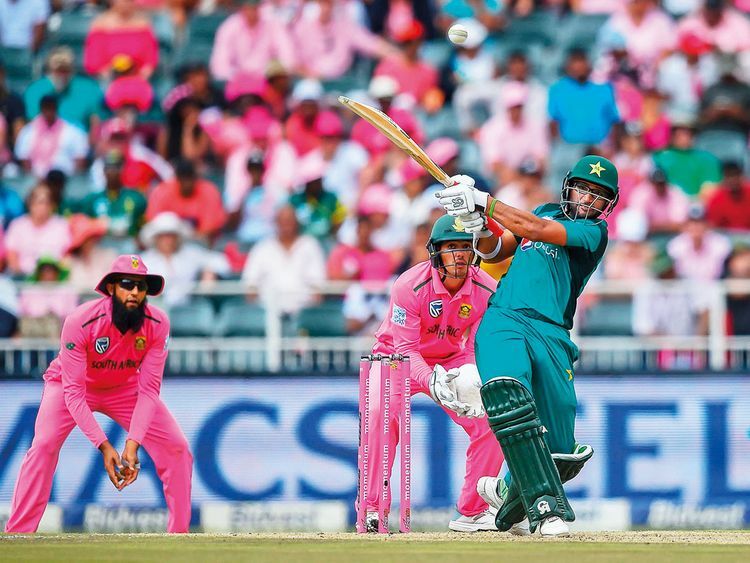 Johannesburg: Pakistan kept their concentration amid a four-game ban for their captain for racist on-field comments to hammer South Africa by eight wickets on Sunday and level the One-day International series at 2-2. Pakistan’s convincing victory at the Wanderers in Johannesburg came hours after the International Cricket Council announced the punishment for Sarfraz Ahmad for an outburst aimed at South Africa all-rounder Andile Phehlukwayo, who is black, in the second ODI last week. Sarfraz’s ban for four game meant Shoaib Malek stood in as captain in Sunday’s game and he led the team to a big victory, setting up a series-deciding final ODI in Cape Town on Wednesday. Pakistan overtook South Africa’s 164 all out with ease — with more than 18 overs to spare — with opener Imam-ul-Haq leading the chase with 71 to follow up on his century in the third game. Fakhar Zaman made 44 in their opening stand of 70 and Babar Azam (41 not out) then joined Imam for a 94-run partnership for the second wicket. Pakistan cruised to 168-2. Imam, whose century came in a losing effort in the third game on Friday, was out one ball before Pakistan clinched victory but he’d done more than enough this time. Mohammad Rizwan, in the team in place of Sarfraz, hit the winning runs by cutting a four away through point the first ball he faced, ironically off the bowling of Phehlukwayo. Left-arm seam bowler Usman Shinwari set up Pakistan’s victory with his 4-35 after being recalled to the team. His wickets came in a devastating six-ball spell when he sent South Africa crashing from 156-5 to 157-9. Rassie van der Dussen, Dale Steyn and Kagiso Rabada fell in the space of four balls in the same over and Phehlukwayo was removed by Shinwari off the first ball of his next over. That ensured South Africa struggled to a poor total and was bowled out in just 41 overs despite earlier half-centuries by Hashim Amla (59) and captain Faf du Plessis (57). They shared a partnership of 101 but no other South African partnership reached 20. Sarfraz’s four-match suspension meant that he would have been available for the final Twenty20 game of the tour but the Pakistan Cricket Board said it had been decided he will return home. Shoaib will captain Pakistan again in the decisive final ODI and the three-game T20 series.